Since I started on this minimalist path, I’ve been trying to stick with gifts that won’t end up stored away in a closet somewhere. Gifts that are either a replacement for something they need/use, edible, drinkable or at least a gift that can be used up somehow. I was done with all my gifts a couple of weeks ago, but.. the other day I decided I wanted to add a couple of people I have never given to before. I wanted to add one of the people that I use for some health treatments, and I wanted to add a girl I have gotten to know at the shopping mall, who is not feeling to good because of an illness. While I was at it, I figured I needed to replenish my stash of face and body oil, so I got my box of goodies out and went to town. Not only did I mix some body oil and face oil for me, but this time around, I even ventured into the uncharted territory of mixing up some shaving oil for B! Lets get back to the gifts! 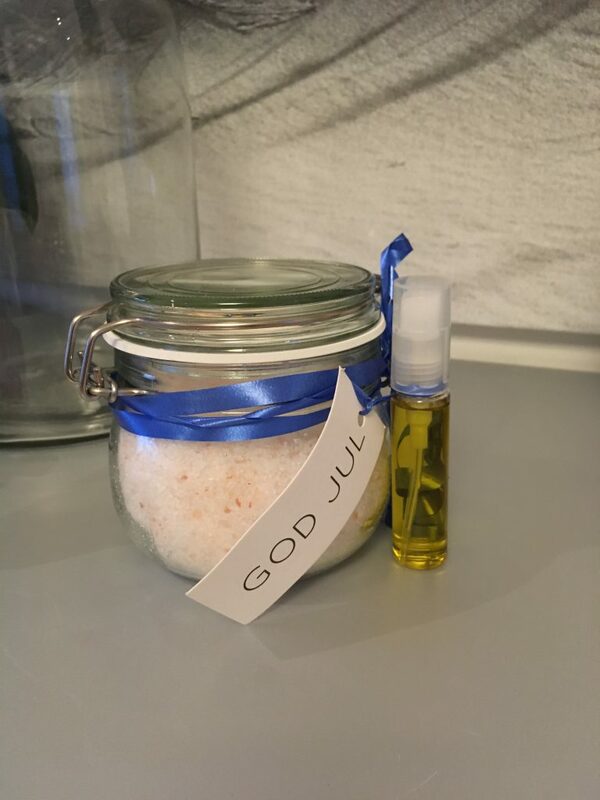 Since I had mixed up some new body oil, I decided to tie a small bottle on the bath-salt jars, to really make it a tiny spa treat. I love mixing these bath salts, not only are they great for a soak and some me time, but their are also great to use to soak your feet (if you don’t have a bath tub). Makes enough for about 4-6 baths, or about 14-16 foot soaks. You can use any salts, in any combination. Mix all the different salts with, almond and essential oils. When the mix is ready, I pour it into glass jars. it won’t smell absolutely wonderful when you open the jar. As there is almond oil in the mix, be careful in the bath as it gets slippery. with some dish-washing liquid, as this will cut the oil. If you worry about the oil, just omit it from the bath salt, as it’s nice without as well.